Acquired in the UK from an English family from the south-west of England that was involved in managing a rubber plantation near Malacca in the 1940s. This unusually large ‘in and out’ offering dish has excellent, clear provenance that dates to the 1940s, when it was acquired by an English family in Malacca. It stands on a low foot and has a pronounced wavy, lotus-shaped rim. The large central medallion shows a standing phoenix amid sprays of peony blooms and foliage against a green background. The undulating border is decorated with flowers and Taoist symbols. The edge is in gilt. 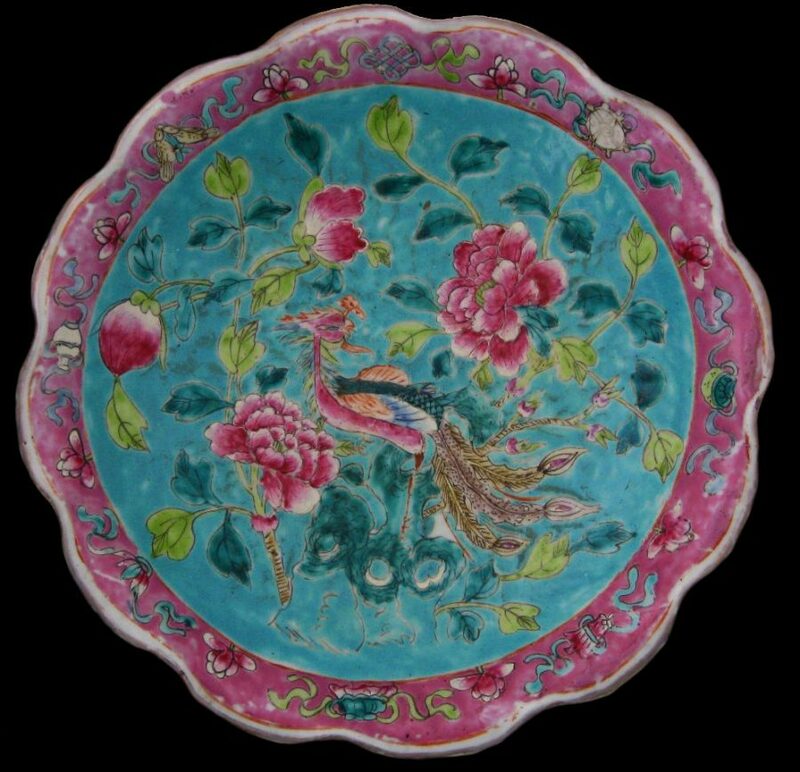 The underneath of the rim is finely decorated with sprays of peony flowers, buds and foliage against a green background. The foot is decorated with a white and green ‘wave’ pattern. At 27.6cm, this example is unusually large. Accordingly, the wavy rim has 12 lobes; most examples have ten. 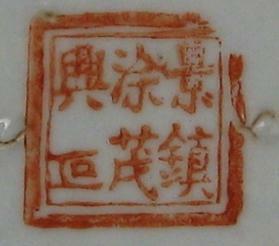 The base has a Jingzhen Tumaoxing Zao factory mark in red enamel. Condition: There are no cracks or chips but there is some wear to the glaze. Offering dishes are almost always thickly potted. They were used exclusively to make religious offerings. They were placed on the square table in front of the higher altar table on which the ancestral shrine was kept. Offerings of food for the household deities and ancestral spirits were placed on the dish. Pairs of chopsticks, usually made of silver or ivory and reserved for this use, often were placed beside the dish. Ho, W.M.,Straits Chinese Porcelain: A Collector’s Guide, Times Books International, 1983. Kee, M.Y., Peranakan Porcelain: Vibrant Festive Ware of the Straits Chinese, Tuttle Publishing, 2009.